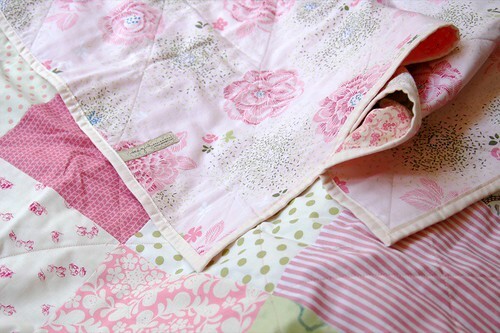 the completed pink+green cot quilt, all finished up to take to mathilda's market in march. i had about three other posts all vying for attention in my brain today but i'm too tired to type much tonight so these pics will have to suffice. have a lovely, cool evening, everyone, see you tomorrow. 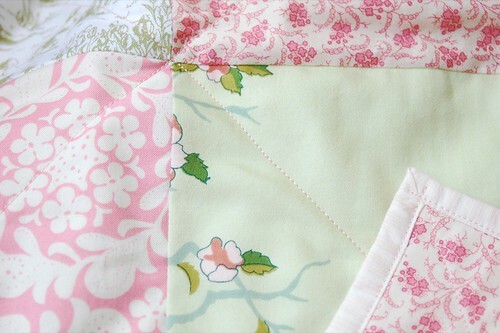 Gorgeous, such beautiful fabrics. 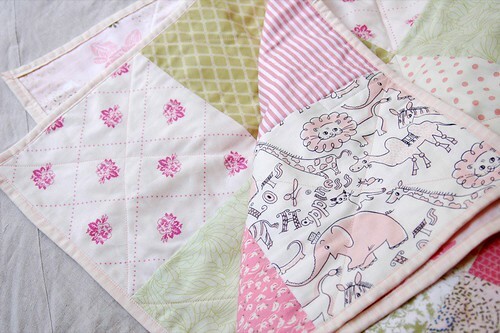 Love the zoo print! A quick question- where do you get your labels made up? I just registered my name, and want to start looking aorund for label ideas, and need to know where to start. thanks bec! i got the labels made ages ago, about 4 or 5 years now, i think, through www.labels-labels.com but the website looks totally different so i'm not sure if it's even the same company! i'm sure there are way more options these days, i'd try searching for "custom woven labels" if you want ones you can design yourself. I love the animal print and the overall color theme. Well done! Very sweet! I love the combination of colours! This is adorable. I love the animal print. Very cute! That looks really sweet Leslie! Lovely choice of fabrics. delicious! love the backing fabric. ooohhhh...so pretty!!! You're spoiling us with your daily posts..I love it!!! can you tell me about the elephant/animal print?? as in who makes it... i need it!! for susan and everyone who has asked about the animal print - i got it at spotlight (of all places). it was in with the quilting cottons but was $18.99/meter so a bit more than they normally are (didn't stop me from buying 2 meters, of course). the selvedge reads "West 22nd CX3426 BABY ANIMALS" but i haven't been able to find a single thing about it online. i was just at the essendon DFO spotlight the other day and they still had some there.